This header picture almost makes me a little sentimental, especially given the current season of my life. We were touring in Alaska this past summer and drove through this town, Kasilof, which we had visited last time we were in Alaska. I had to go back in my Alaska folder from 2013 and find the picture that I remembered taking there on the swing, this one, above. So many memories. So many great times, back when all ten of us kids traveled together. I'm so thankful for those years. Everything is changing now, in so many ways, and even though these are the happiest of days, times are surely and definitely changing from what they were. My siblings didn't become my best friends accidentally. It took work, and a lot of intentional parenting on the part of my father and mother. We did not used to be best friends when we were younger. We went to a church and were in a social circle where nearly everything was age-segregated. I was friends with only kids within twelve months of my age, and it was the same way for my siblings. That was just how we rolled. Then I turned twelve, and around that time God did a huge work in my father's heart, and turned his heart toward me + my siblings. He (my father) sold his booming business, we switched churches, we switched mentalities and how we did made decisions, and within a few months almost every single aspect of life as I knew it, changed. That is another very long story for another time, but I have to say that much at least for y'all to understand the foundation of the change that happened in our lives. We seemed to lose most of our other friends and suddenly, siblings was what we had left. It was quite something. Definitely not the most comfortable or seamless change that ever occurred in my life. But absolutely one of the best ones. We started doing family parties, family camps, family outings, family everything. We were still very social but instead of all breaking off into our own little age-segregated groups, we started interacting + socializing with bigger groups, including lots + lots of other families. We learned to develop close friendships. You don't just wake up one day and ta da! You are best friends with someone. No. With ANY FRIENDSHIP it takes work, and effort. And it is no different with siblings. The only way to forge a strong friendship is to invest work and time and energy into it. Relationships of any type take work. You can't expect something to just fall together and into place. You will get out of it whatever you are willing to put into it. With siblings, you have to be intentional. If you are in a big family, you have to be even MORE intentional, because there are so many more people to connect with. Families that are tight have the most incredible times + memories ever. Just believe me. If you have a close family now, then you know exactly what I mean. (note: even if you don't have a close family now, make a commitment that with your future family, someday, you will make close relationships a priority) Anyways, there are even more relationships to tend when you have a big family. And with all those people there are different love languages, and temperaments, and all that. There are a lot of different elements happening! Siblings' needs vary also depending on their love language. For one, that "something special" might be writing a simple note and leaving it on their bed. The next sibling might need some quality time going out for ice cream or coffee. A different sibling might need a special gift. And the next one just a hug and a little snuggle time. It can be so different from person to person! What I want to encourage you to do is to learn your siblings' love languages and work on connecting with them in the ways that are most meaningful to each one. The main thing in relationships, after all, is being intentional and choosing to spend time and make the effort. If you aren't close to your siblings and this just sounds overwhelming to you, then don't worry-take heart and resolve today that with the help of Jesus, you are going to turn your little boat around and do life a little differently to change your course! Start small. If you haven't been investing time into your sibling relationships and you aren't close to begin with, than don't expect that you'll start out with long heart to hearts and lots of love reciprocation! It's gonna take a little time to change the course and earn their trust. Also you may want to check out "Making Brothers and Sisters Best Friends". (read my full disclosure here) This book is the real deal and is so great for siblings who want practical tips on getting along with each other and developing close-knit relationships. Run to Jesus for help. Cry out to Him for your siblings and for healing in your relationships. Don't try to do this on your own. You need Someone bigger than you to fight this battle with you! And it is a battle, absolutely-Satan loves nothing more than destroying families and its a lot harder to destroy a tight, close-knit family, than to come in and destroy a family that hates each other to begin with. Recognize that you are a part of the problem. You won't get anywhere if you are thinking it's just your siblings that have the issues and the problems. It always takes two. If you don't have a good relationship, then you are partly to blame. And you'll have to realize this before you can proceed in a different direction. Resolve to change. You're going to have to work at this, friend, and you've got to be willing to invest time and energy, as mentioned before. You might have to cut some other things out of your schedule to make time for your siblings. You might even have to take a break from some social aspects of other relationship to make more time to spend with your family. If you want a close relationship badly enough, you will be willing to sacrifice something to get it! My sister and I collaborated and wrote a full article, last fall, on this subject of close sibling relationships. It was published in the Kings Blooming Rose. (a magazine written by a friend of mine, to encourage young women in living for Jesus) Today I am giving away three copies of the fall 2016 magazine, that features our article. Leave a comment with your name, to enter to win one! Winner will be announced here at the end of this post (added note) on Saturday morning, August 26th. Also I would love to hear your thoughts/questions on this topic as well! What are some ways YOU have worked on your sibling relationships to become best friends with your siblings? Have a beautiful rest of your week, my friends! Please send me an email with your mailing address and I will get those out to you! Thanks for all of you comments + participation! Hello, I would love to enter for your free copy of the magazine. My name is Natalie McKay. Thanks! Great thoughts. It's something that I've been working on latwly. It does indeed take a lot of intentionality. My name is Carissa Pentimone. I would love to enter for the magazine! Beautiful post, Chelsy! It has encouraged me a lot! I would like a free copy of the magazine. My name is Anna. Thank you for sharing this Chelsy! Your story of how you all of a sudden only had your siblings left over as friends for a while, sounds very similar to how it went when I was little when my parents decided to start homeschooling in the middle of the school year and we changed churches as well. It did help that we were very close as siblings since we were little. One thing that I decided to do to become very close friends with all my siblings was as much as possible to include them in everything I did, for example if I was going out to sled or ski or swim, pick berries, I'd take them along, the same with when I was baking or even when I had a friend over, we would "share" that friend =) I also look into doing something special for each sibling that I knew he/she would like occasionally. Once you're in the habit of doing things together, it is a lot of fun, and it's rather boring not having a sibling around!! Would love the chance to win a magazine! I love this post... so good! I would also like to enter to win a copy of the magazine. I would love to win a copy. Thank you for giving them away. Oh, I knew that you and Allison did a guest post in one volume but I missed that one and didn't know which one it was, so I couldn't buy it. :( I'd love this! I also have nine siblings, so relationships are definitely a big challenge sometimes. My biggest struggle has always been during that phase that all boys go through. I remember my first younger brother to go through that phase drove me insane, but this second one is definitely going better. Patience has been a vital key, especially when brothers are going through that 'boy to man' phase (around 9-12 years for my bros). I'm happy to say we have an extremely close-knit family! Thanks for the encouragement! This is something I've been thinking about and working on lately! I've found it so helpful to try to do something extra special for at least three of my six siblings every week (besides all the normal things I do to spend time with them). I'd love to read the article you wrote! Thank you for these great thoughts on sibling relationships! Siblings make the best of friends! :) ~Kaitlyn R.
There is an eight year age difference between my sister and I. Because of poor decisions she made when I was little we were not able to spend allot of time together so we didn't develop a best friend relationship. Now that we are both adults, she 34 and me 25, we can begin to work on our relationship and become closer even though she is married, a mother, and works full time. Chelsy, do you ever fight with your siblings because of bad attitudes and misunderstandings? If so how do handle it and resolve the conflict so you don't make the other upset? Dear chelsy .. thank you so much for your time in sharing with all of us!! We were nine at home and for many years all we had for friends was each other. ..looking back now I'm so thankful relationships was so important for my parents... my brothers n sisters are still my best friends..after my honey ;) it's such a blessing to know there still are families with those strong values!! God bless you dear!! So inspiring - I know my siblings and I could be closer. I'd love to read the article! Wow...This is such a great post. I have been trying to work on my relationship with my siblings. I mean I am with them all the time so it is pretty important. Thanks so much for sharing this Chelsy! I also would like to enter for the magazine. I'm Laura Danner. Have a nice day! This post is so beautiful, Chels! You are constantly setting the example to all of us in how to do the sibling thing well. I love his post. I only have two older brothers who are 7 and 9 years older than me - I wouldn't say that growing up we were close at all, but as adults we have become much more intentional. As my husband and I continue to grow our family it is our deep desire that our children would become each other's best friends - such an encouragement to read about how this came about for your family! Thanks for sharing! I would like to enter the give away! Chelz I have a question. Your sister Allison accepted me on her Instagram but I can't see anything when I go there. Do you know what may be the problem? Thanks for the post, sweet girl! 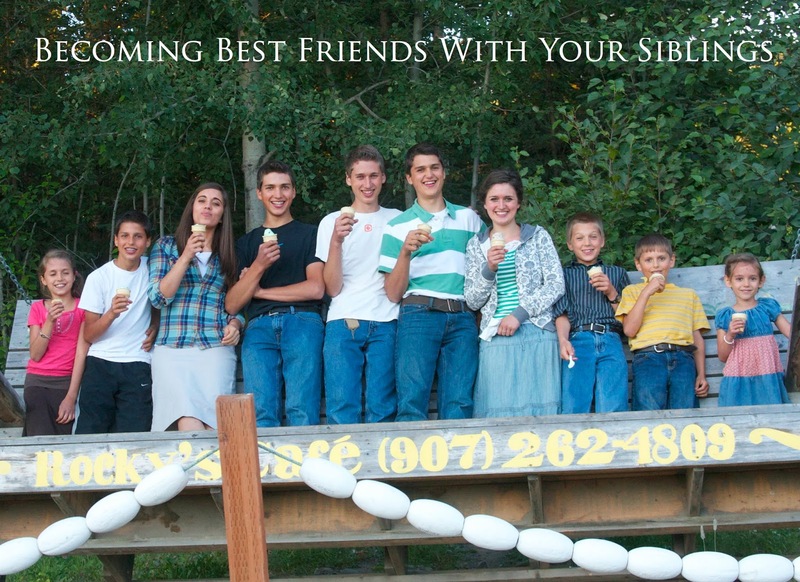 I too come from a big family and need or desire to grow closer to my sibs. Any suggestions on how to treat or show my appreciation to the little toddlers?